Halifax RUFC have confirmed the appointment of former Leicester and Gloucester back rower Neil Spence as their new head coach. Spence, who replaces Giles Hetherington at the helm of the Ovenden Park club, enjoyed a distinguished playing career having played in the Premiership and represented England at under 18 through to under 21 level. He also played in France for St Nazaire, returning to England to play at Bradford & Bingley and then Ilkley. He was part of Yorkshire’s County Championship-winning sides in 2005/6 and 2006/7. Spence was forwards coach at Ilkley before he spent two seasons as head coach at Halifax’s local rivals Old Crossleyans. The level three coach will now combine the role at Halifax with his current position as a RFU Community Coach in West Yorkshire. Halifax director of rugby Tony Curtis said: “We are absolutely delighted to welcome a coach of Neil’s calibre to Halifax RUFC. “He is a rugby man through and through with an impressive record as a player and a coach. 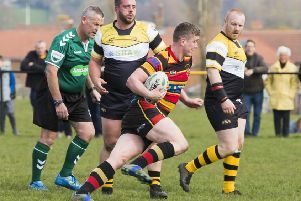 Players and club members will get a chance to ‘meet and greet’ Spence at Ovenden Park on Thursday June 30, with pre-season training set to get underway on Tuesday July 5. Hetherington stepped down to take a new job away from Calderdale, having guided Halifax to promotion to Yorkshire Three in 2014-15. Anyone interested in joining the ‘rugby revolution’ at Halifax RUFC can email halifaxrufc@hotmail.com or call Curtis on 07554 013307.